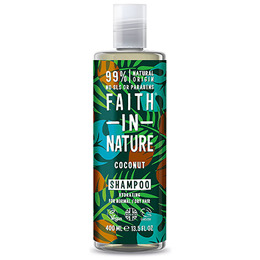 Containing organic coconut oil, and exploding with aromas to enrich your senses and soothe your day, this shampoo is a tropical holiday for your hair and scalp. 100% natural fragrance, with organic coconut oil. Free from parabens and SLS. Aqua (Water)***, Ammonium laureth sulfate*, Maris sal (Sea salt), Cocamidopropyl betaine*, Polysorbate 20*, Glyceryl laurate*, Cocos nucifera (coconut) oil**, Glycerin*, Tocopherol*, Helianthus annuus (sunflower) seed oil*, Parfum (Fragrance)*, Steareth-4*, Glycol distearate*, Sodium benzoate, Potassium sorbate, Citric acid*, Benzyl alcohol*. 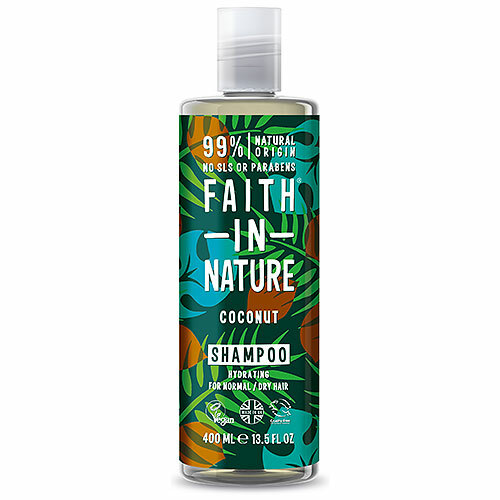 Below are reviews of Faith in Nature Coconut Shampoo - 400ml by bodykind customers. If you have tried this product we'd love to hear what you think so please leave a review. Nice shampoo. Leaves my hair feeling soft and clean.